JAMIE HERRELL - Jamie Herrell was born on the 12th of July 1994. She is a Filipino-American actress, TV Host, dancer and beauty queen who was crowned Miss Philippines Earth 2014 on May 11, 2014 at the Mall of Asia Arena in Pasay City, Philippines. Herrell then represented the Philippines at the Miss Earth 2014 pageant on November 29 in Quezon City emerging as the ultimate winner. Miss Earth is an annual international beauty pageant promoting environmental awareness. Along with its rivals Miss Universe and Miss World, Miss Earth is one of the three largest beauty pageants in the world in terms of the number of national-level competitions to participate in the world finals and one of the most publicized beauty contests in the world. The reigning titleholders dedicate their year to promote specific projects and often address issues concerning the environment and other global issues through school tours, tree planting activities, street campaigns, coastal clean ups, speaking engagements, shopping mall tours, media guesting, environmental fair, storytelling programs, eco-fashion shows, and other environmental activities. The Miss Earth winner is the spokesperson for the Miss Earth Foundation, the United Nations Environment Programme (UNEP) and other environmental organizations. The Miss Earth Foundation also works with the environmental departments and ministries of participating countries, various private sectors and corporations, as well as Greenpeace and the World Wildlife Foundation (WWF). Miss Earth is part of the Big Four international beauty pageants. 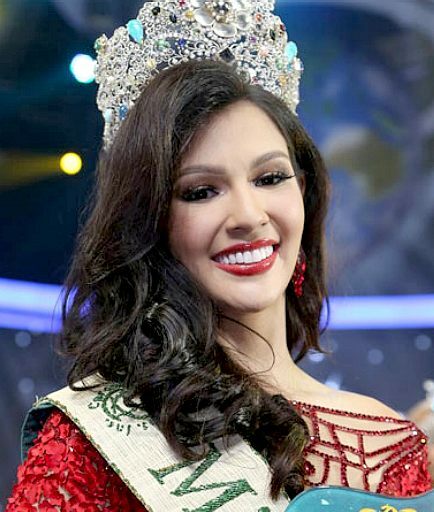 The current Miss Earth is Jamie Herrell of the Philippines who was crowned on November 29, 2014. Traditionally, Miss Earth lives in Manila during her reign. This webpage is copyright Cleaner Oceans Club © July 2015. The name Miss Ocean™ is a trade mark of the Cleaner Oceans Club™. The blue bird in flight logo is a trademark of BMS Ltd, used under Licence.